Fresh figs are exotic, beautiful and good for you, too. They contain fibre and vitamin B6. 1. Preheat the oven to 200°C, gas mark 6. Place the figs into a shallow baking tray lined with baking paper. Dot the figs with the butter. Mix the honey and orange juice in a small bowl, then pour over the figs. 2. Place in the oven and bake for 15 minutes or until sticky and soft. 3. While the figs are baking, place the Greek yogurt into a small bowl, add the zest of the orange and mix together. 4. 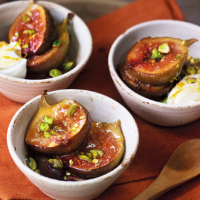 To serve, divide the figs among 6 bowls and serve with a dollop of orange Greek yogurt and a sprinkling of chopped pistachios.